We started the harvest with the picking of our Sonoma Coast Pinot Noir from Gap’s Crown Vineyard on September 6th and we were off to the races! 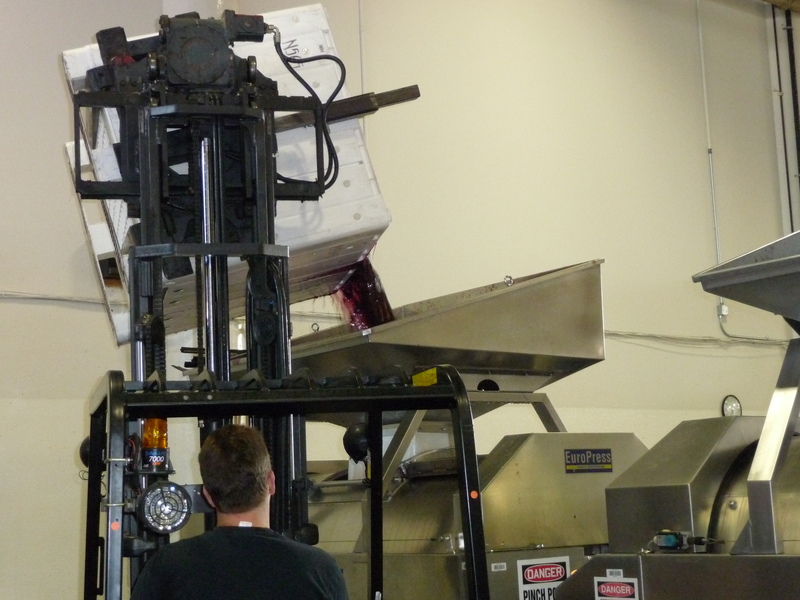 We sorted the grapes–sorting removes any green leafs, bugs or moldy grapes that might have gotten in during the picking. The term for these ‘sorts’ of things is MOG, Material Other than Grapes. We did not have much to do as the pickers did a great job in the field, picking almost flawlessly clean clusters. Sorting is conducted just before de-stemming, which removes the grapes from the stems. In most cases, crushing immediately follows de-stemming. However, the grapes were so gorgeous, we decided not to (see above *) and instead opted to do a hundred percent whole berry fermentation and not crush the grapes. The intention of retaining more of the fruit character in the finished wine was behind this decision. Next, the bin full of de-stemmed grapes moved in to the cold room for a Cold Soak period of five days at about 50 degrees Fahrenheit. 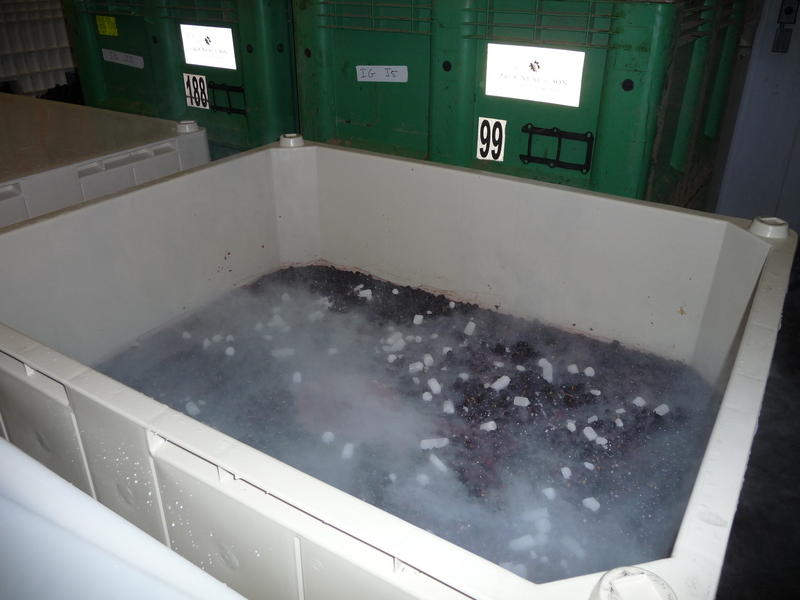 Cold soak delays the start of fermentation and the skins have a longer time to release their color into the wine. We started the three-times-a-day punch downs, pushing the cap (the grapes skins that rise to the top during fermentation) down into the must in order to get better color extraction and prevent anything bad from forming on top. This is the fun part. We even gave up our gym membership for a while as doing the punch downs on such a large bin at 50 degrees in a freezer room will give you an incredible work out in no time! At this temperature and stage, there is no cap to speak of so punch downs are very hard. Add to that covering the whole thing with dry ice to form a protective layer of C02, measuring and recording sugar level (Brix) and temp three times a day and you get the picture of how busy one can get. hard work in the cold room! After five days in the cold room, we were glad to move in to normal room temperature to get the fermentation started and do our punch downs in more ‘normal’ surroundings. Our plan was to try to prolong fermentation by trying to keep a moderate fermentation temperature, but the yeasty beasties had other plans! That thing took off and shot up to 85-90 degrees in no time at all. Since we truly believe in as little intervention as possible in winemaking, we just let nature take it’s course. Seven days later, all the sugar was gone, the yeast was exhausted from all that feeding-on-sugar frenzy and it was time to press. We first drained all the free run out of the bins and then dumped the must into the press. We proceeded to press in phases, tasting and monitoring the tannin level of the wine coming out of the press until we felt that we had just the right balance of tannin to fruit. This is the tricky ‘artistic’ part as you need to try to guess what the final blend will taste like when the press wine will be combined with the free run wine. We ended up with about 80 percent free run and 20 percent pressed wine. That was a lot of fun! With the newly minted wine put away into the barrels, French oak, (Francois Freres, Medium Plus Toast, if you must know), we can now take a little breather. Simultaneously to making our first commercial wine, we continue making wine at home with friends. As luck would have it, our Carneros Pinot Noir grapes must have gotten together with their Sonoma Coast brethrens, decided to conspire against us and mature during the same week. We ended up shuffling back and forth from the winery to our home in Berkeley to do the second shift on our Carneros Pinot. We were so tired by the end of each day, we slept very well during these nights. Much smaller scale, Ben still manages to do all the fun work! Now that both wines are in barrels we are taking a little breather to write about it and pay some attention to the ‘business part’ of our venture (but that is another post all together). All this while we wait for out Lone Oak Vineyard Pinot to be picked. We are going down to visit this vineyard in the Santa Lucia Highlands this weekend, so we should have some picture to post and more stories to tell shortly. Bonne Chance,Venant du Village Vieux Champagne, France.